1. five years form now. how do you want people to see as a person? 2. favorite bible verse mo? “For I know the plans I have for you; plans to prosper you, not to harm you; plans to give you hope and a future.” I love it! It’s a great declaration of faith. 3. do you ever wear make-up at school? Yes. I should’ve been serious on my Christian life when I was younger, such that I could’ve served God more. Well, I’m enjoying my Christian life now, so I guess the regrets are being transformed into challenges and drives. 6. landlords rights about a apartment when left without payment? That varies from one country to another. Google it! 7. so that's malaysia? Manila's still better. Uhm, the temperature is quite lower in KL. But then, MY and PH are almost the same—very homey. I do understand and get your dilemma. That was my problem before I entered college. In my case, the confusion was regarding the university I will be going to—either go to an excellent but far from home, church, and ministry univ or a not-so-excellent but near home & my ministry univ. I had my own plans for myself, of course. Well, amidst all the choices I had for college, I chose the Lord’s plan which seemed to be really hard and rough. I knew I would have better chances of learning at the far univ, but I also knew God wanted me to stay. Now, I am advising you to seek the will of God above your OWN plans, for HIS wisdom passes all understanding. We may not understand the purposes of His plans at first, but I’m certain that the Lord’s plans are arrangements for the BEST. Obedience to God may be tough (remember the story of Abraham?) but I tell you, nothings better than His plans. How do you seek the Lord’s plans for you? That’d be a bid factor in resolving your confusions. :) Hope I helped. 2. anong klaseng mga tanong ang ayaw mong sagutin? Yang tanong mo ;p Kiddin. I don’t have plans for r’ships now kaya I often turn suitors down. I’m not good at upsetting people so I hate answering questions like “pwede bang manligaw?”, “may chance ba ako?” and all like. 3. when you're doing your p&w, how do you decide on your line up? When I was new to worship leading, I admit I chose songs for my line-up by what I thought was good to sing for p&w. I’ve started worship leading on 2005, and through the times, I’ve learned how to really choose the songs for my line-ups. Now, even if we don’t have a scheduled youth event, I ask God for revelations about the songs. So, even before an event, I already have some songs in my heart that I know the Lord wants us to have for our worship. Also, I ask Ptr. Phil, our youth pastor, if he has suggested songs ‘cause usually, he asks me to add some songs on my line-up as related to his message/ preaching. 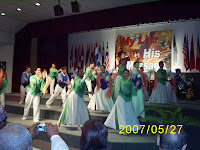 § Primarily, I set my line-up through songs that I receive from God—yes, I receive revelations on such during my devotion time, bible-reading time, through dreams, and even on normal daily routines like taking a shower, reading books, transportation (to school, for example) walking in the school campus, etc. Do you lead worship, too? Wow. 10th batch na 'to ng Q&A posts ko. I’ve read a review on Dell 3000cn printer and found out that streaks are one of the printer’s flaws. little horizontal banding detectable when we examined closely. 3. Pampanga? That’s ur mom province right? Are u always visiting there? Never been in that place. Hello. I guess by “That’s ur mom province right?” you meant it’s my mother’s province, eh? Anyway, both of my parents are from Pampanga. I didn’t grew up there, though. We do visit our place at Pampanga several times a month. Uhm, it’s just a 4-hour drive from San Jose City where we’re currently staying at. 4. Kumusta ka na ngayon? Anyway, I’m having difficulty on controlling myself from spending too much on the internet. Also, I’m kinda lazy for school right now. Err. Sarap matulog ‘di ba? On a deeper note, I’m doing great! Wala akong problema. Ang saya! 5. Was psychology your first choice of course? Actually, it wasn’t. Even before I stepped on being a senior high school student, my choice was to take up either BS MedTech or Biology since I wanted to pursue a medical career (such are accepted as pre-med courses). But then, people, thoughts, and decisions change (I have a lengthy blog about that). I suddenly enrolled at CLSU with BS Biology as my course. But then again, during the second semester of my first year in college, I shifted to Psychology (Ψ).